I have been baking a lot more than usual these days, and I blame the cold weather. It looks like we are due for another round of storms in these parts, so you may need something to keep yourself warm. These muffins are great for a lazy weekend breakfast, and they are perfect if you have little ones who want to help you stir and bake. 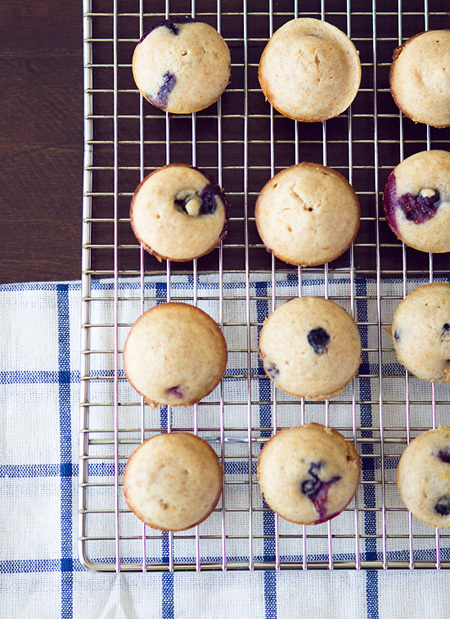 I made mini-muffins because they are just too darn cute, but you can also do regular size. The recipe calls for a little bit of zest from an orange, which I think gives it the perfect hint of citrus! Spray muffin tins, or line with muffin cups. Combine first 4 ingredients in a small saucepan, and stir over medium heat until the butter melts. cool until the mixture is warm to touch, then beat in the eggs. Sift Flour, sugar, baking powder, and salt into a large bowl; add milk milk mixture, and stir just until blended. Fold in berries. Divide batter into muffin cups, filling about 3/4 of the way full. Bake until golden and a toothpick comes out clean, about 15-20 minutes for regular size muffins, or 10 minues for mini-muffins. oh these little bite sized babies look scrumptious! i am sure my kiddos would love them too:) happy weekend! I made these yesterday, so good! Thanks for the recipe, it's a keeper for sure. I need to try these ASAP!